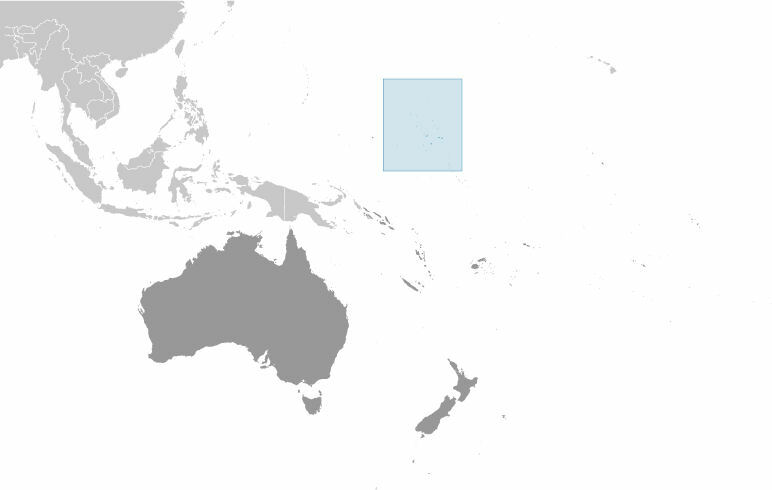 The Republic of the Marshall Islands, with a population of 73,376 (July 2016 est. 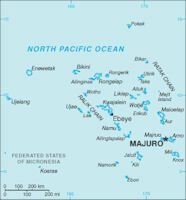 ), has no regular military forces, apart from the Marshall Islands Police. Defense is the responsibility of the USA. Between 1946 and 1958, while the Marshall Islands were part of the U.S. administered, United Nations Trust Territory of the Pacific Islands, the United States used two atolls in the northern Marshal Islands-Bikini and Enewetak - as nuclear test sites. During the testing period, 66 nuclear bombs were detonated on or above the two atolls, destroying some of the land and leaving them contaminated with radioactivity. In March 1954, the United States conducted one of the first hydrogen bomb tests, code-named “Bravo,” on Bikini. Bravo was the largest nuclear device ever detonated in the atmosphere by the United States, producing a much more powerful explosion than expected. Because of a shift in wind conditions, radioactive fallout spread to two inhabited atolls-Rongelap and Utrik-where 239 people were living. The Marshall Islands is comprised of 29 atolls and five single islands, which form two parallel groups--the "Ratak" (sunrise) chain and the "Ralik" (sunset) chain. 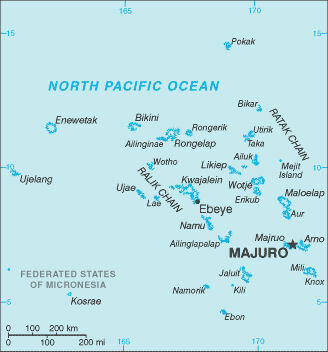 Two-thirds of the nations population lives in Majuro and Ebeye. The outer islands are sparsely populated due to lack of employment opportunities and economic development. The islands of Bikini and Enewetak are former US nuclear test sites; Kwajalein atoll, famous as a World War II battleground, surrounds the world's largest lagoon and is used as a US missile test range; the island city of Ebeye is the second largest settlement in the Marshall Islands, after the capital of Majuro, and one of the most densely populated locations in the Pacific. As a coral atoll nation, one of only four in the world, the Marshall Islands offers a very unique environment and landscape, consisting of saltwater lagoons encircled by white beaches and small, lush islands. In all, the Marshall Islands contain over 1,200 individual islands, 870 reef systems, 800 species of fish, and 160 species of coral. With dozens of WWII ship and plane wrecks, including the world’s only diveable aircraft carrier (the USS Saratoga), the flagship of the Japanese World War II fleet (the Nagato), and a German Cruiser launched by Adolf Hitler (the Prinz Eugen), the Marshall Islands offer unparalleled wreck scuba diving. The total land area is about 70 square miles (181 square kilometers). The mean height of the land is about 7 feet above sea level (2 meters). The Marshall Islands has a low crime rate. The most common crimes are break-ins and thefts from homes, hotel rooms, and vehicles, as well as occasional random acts of vandalism. Alcohol plays a role in most crimes, especially assaults. The risk of being involved in an incident increases at night and in isolated locations such as beaches. Majuro atoll has only one main road and there are no street addresses or house numbers. The road is paved, but there are few traffic signs and no traffic lights. Drivers should be alert for dogs, chickens, and pigs roaming the streets, and children darting into the road, especially after dark. Children frequently play dangerous games with vehicles, running in front of or behind vehicles. Drinking and driving is common, especially on the weekends, so use caution. Walking beside the street can be dangerous due to poor lighting, the absence of sidewalks, and drivers who may have been drinking. On outer atolls, there is no transportation for evacuation to the rudimentary medical facilities on the two atolls with hospitals (Majuro and Kwajalein). Vehicle traffic proceeds slowly, rarely more than 25 miles per hour. Roads experience temporary flooding after heavy rains and during especially high tides. Because there are few streetlights, visibility is poor, and night driving requires special caution. Marshallese citizens typically dress very modestly with tops that cover their shoulders and pants, dresses, or shorts that fall below their knees.